It is 40 feet long, 102" wide, and 12.5 feet tall. It has a kitchen slide on the driver's side of the coach that gives us an extra 18" of space inside when we put the slide out. We were able to pick out a chair for our living room. We got a nice reclining chair that has a nap feature. This is especially good for playing the hippopotamus game -- when reclining in the chair, the headrest will either stay up so you can read, or go back so you can nap. Our bedroom has a queen size bed and lots of closet space. We have a basement underneath our kitchen for storage. There are 2 bays that are the full width of the house. It has a mid-entry door. 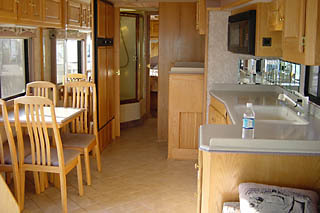 Most diesel-pusher motor homes have a door at the front by the navigator's seat. Our door is in the middle of the "curb-side" which means we come in to our house through the kitchen. Do you need a license to drive that thing? Surprisingly, no. There's no special license required to drive our house. 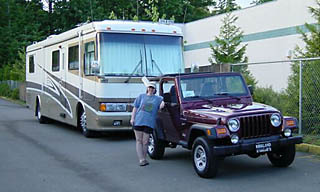 Canadian residents need to get a commercial license to drive RVs in Canada, but US residents can drive them in America or Canada with no special licenses. Pete is the regular driver and is researching driving schools so he can drive on more than caution and instinct. Are you really camping in that thing? Although we'll spend most nights at campgrounds, it's not really camping. It's a lot more like a condo on wheels. We have 2 color TVs and can get cable TV at many campgrounds. We also have a 10 gallon hot water heater which is enough for nice hot showers. The kitchen has tile floors, corian counter tops, a convection/microwave oven, and a refrigerator that has a freezer with an icemaker. We've also got 2 air conditioners to keep things cool inside. And yes, Mary brought her espresso machine.